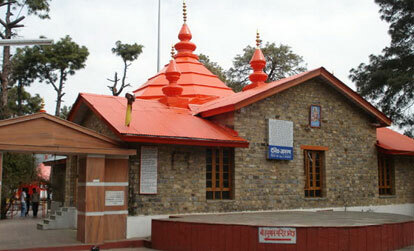 As one visits the famous Sankat Mochan Mandir in Shimla, one is often attracted to a number of crushed lemons strewn around on floor of the front court yard of the temple. Many of us may have also witnessed the ceremony of ‘Car Pooja’ being performed by the temple priests in these very premises. It is believed that a new vehicle purchased should be sanctified by the holy priests before being put into normal use. Accordingly, formal Pooja is performed for all new vehicles, may they be four wheelers or two wheelers at the temple a ceremony which is followed by placing lemons under all the wheels of the vehicle. As the vehicle is moved over the lemons, they get crushed under its wheels. On my visit to the holy temple on the first holy Navratra day my curiosity increased as a number of new cars were seen parked in the court yard for Pooja. My inquiry from the temple office revealed that the practice now also had the due acceptance of the temple authorities headed by the Sub Divisional Magistrate (Rural). For getting the Pooja performed, one has to make due payments at the temple office which issues a formal money receipt amounting to Rs.501 for the four wheeler and Rs.251 for the two wheeler. The funds so collected are utilized for the maintenance of the temple as well as wages of the priests who are on their rolls now. The affairs of the temple had been taken over by the local authorities in February 2011 while earlier it was being run by private trustees. The temple priests are assigned the job in rotation since they also earn by way of ‘dakshina’ also given by the vehicle owners. I learn that during the Navratra Pooja days, the number of vehicles increase ten folds as these days are considered ‘shub’ for such purchases. While on a normal day, only four or five vehicles are brought for Pooja, the number increases to 40-50 during these holy days. This may be also due to the fact that a number of vehicle showrooms like Goyal Motors, Maruti Nexa, Tapan Hyundai, Mahindra Motors, Tata Motors, Anand Toyota Motors besides those of two wheelers have come up in the periphery over a period of time. While the numbers may indicate our belief systems and practices, I got a jolt of the day to learn that one of this temple priest who had also bought a new car way back in 2014, and had got the formal Pooja performed, had died in an accident as his own car had rolled down a hill near his village home a few days after the purchase. So rituals apart driving safe is the key. Symbolic, otherwise truck drivers who have a dangling thread of green chilies and lemons hanging (all of them) could have averted many accidents which get reported each day.